It’s named for a terrapin turtle, not a rattlesnake, but this is a drink with a bite. Make no mistake about that. Showing up in print first in Ted Saucier’s 1951 cocktail guide, Bottom’s Up, the Diamondback comes from the post-war boom in cocktail culture. That’s the one that inspired people to buy those cocktail sets that were handed down to some of us by our parents, grandparents,or great-grandparents. Nevertheless, as any true cocktail snob will tell you, that was a far cry from the highpoint of pre-prohibition cocktail creativity, despite the era’s booze-loving trappings. By the 1950s, cocktails were a pretty basic matter for the most part. In a funny way, the ingredients in a Diamondback feel almost like a throwback to a much earlier time in tippling history since both rye and apple brandies became increasingly rare in U.S. stores in the second half of the 20th century. Indeed, it was apparently the house drink at a venerable East coast bar, and it’s possible it’s history actually goes back a bit further than I know. So, yes, the makings here are bit old school for the cast of “Mad Men” but not hard to find these days,though also not exactly inexpensive; the Diamondback contains chartreuse, an herbaceous and powerful product that a bunch of monks have a monopoly on; I hope they’re doing good works with the $50.00 or so you typically have to spend on one of their bottlings. Also, being comprised of three very potent brews, one a bit outre, this is a drink that Roger Sterling, at least, might have appreciated. Combine your ingredients in a cocktail shaker or mixing glass with plenty of ice. You can stir this one if you like, but it will come out very, very strong. I shake it. 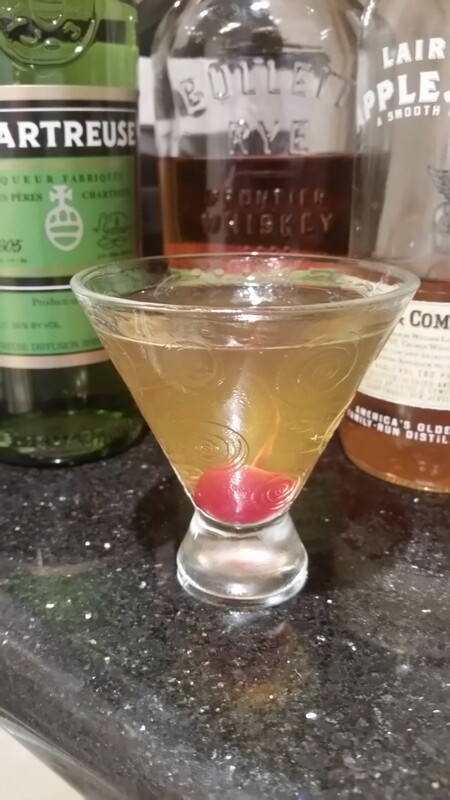 Strain into a chilled cocktail glass, add your cocktail cherry. You may toast our amphibian friend, the diamondback terrapin. More than one of these drinks and you won’t be moving much faster than one. According to cocktail blogger Doug Ford, the Diamondback was originally the Diamondback Lounge Cocktail and was the house beverage of the Lord Baltimore Hotel bar in guess-what-southeastern city? Originally, it was made with yellow chartreuse, which is milder, but most modern recipes call for the green variant. And let’s be clear, by “milder” we mean 80 proof. Green chartreuse clocks in at a stunning 110. It gets worse, or perhaps better, because most of the people making this drink at various Internet locales are using 100 proof ryes like Rittenhouse and Laird’s Straight Apple Brandy, which is also bottled in bond, i.e., 100 proof. My gut reaction is to think that this might be a little too much of a good thing. In any case, the reality is that most of the boozes I actually had on hand this week were very slightly milder, which I thought might compensate to some degree for using the oh-so strong, but admittedly flavorful, green chartreuse. The first time I made a Diamondback, I frankly found it a too strong. I used the last of the only 100 proof rye I had, 1776, but compensated for its strength via that fact that I’m too cheap to own a bottle of Laird’s Straight Apple Brandy at present; I went with Laird’s somewhat maligned 80 proof Applejack. (It’s blended with neutral spirits for a lighter taste which I think is very pleasant.) 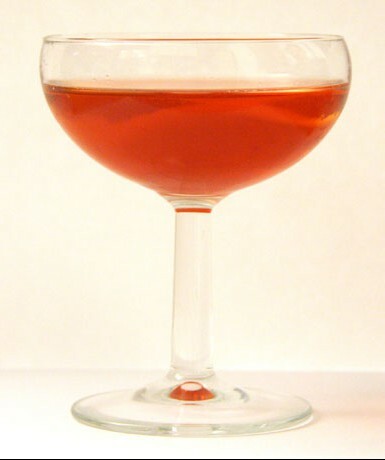 Then, I realized that, contrary to the cocktail snob’s dictum that drinks without juices should be always be stirred, the Diamondback was originally shaken. Especially as I don’t buy that particular dogma one little bit, I thought that made for a major improvement. I also tried the Diamondback with 90 proof Bulleit Rye and Alberta Dark Rye. Both were just fine, but I give the slight edge to the one named after a Canadian province. It wasn’t the fact that it’s makers finally decided to send me a replacement bottle after the incident of the torn off plastic thingy, at least I don’t think it was. It’s just the gentler, sweeter flavor seemed to mellow out this fire-breathing turtle of a concoction.